Help Me Find a Job! What Sort of Career in Addiction Awaits You? What is a Peer Support Specialist and How Can You Become One? Considering a Career in Addiction? This is a Must See! What is a Certified Recovery Coach and How Can You Become One? How Disorganized is Your Addictions Staff? Should an Employer Google Recovery Jobs Applicants? 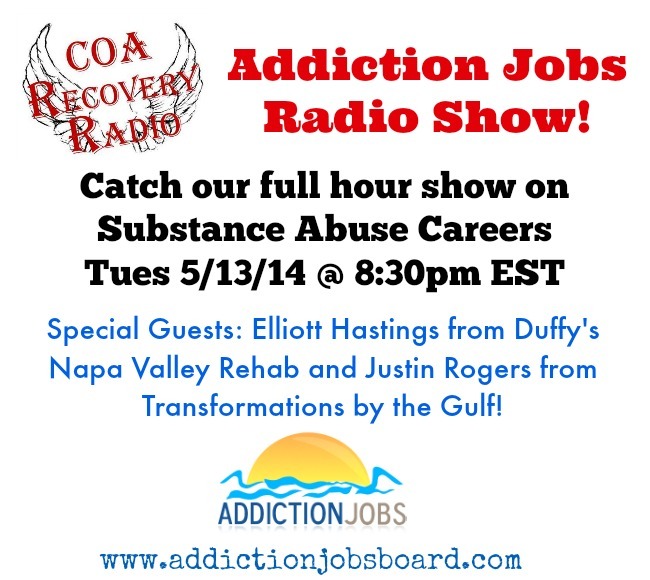 Careers in Addiction – Check Out Our Radio Show! Addictionjobs.com was recently invited by City of Angels Recovery Radio (COARR) to create and produce a full hour radio show on careers in addiction. We spent part of that hour going through several of the different careers and designations in addiction jobs and a few of the requirements for those positions. A few that were covered were: Peer Support Specialist, Recovery Coach, Substance Abuse Prevention Specialist and the Certified Alcohol and Drug Counselor. In the second segment, we interviewed Elliott Hastings, who is a substance abuse counselor at Duffy’s Napa Valley Rehab. Hastings gives us a great overview of the position, his education background and the daily life and challenges of working at a residential rehab facility. In the final segment, we speak with Justin Rogers, who is a House Manager with Transformations by the Gulf. Rogers went through rehab at this facility and started working there soon after completing his treatment. We speak to him about entry-level positions in the substance abuse field as well as the rewards and challenges of working with others new in recovery on a professional level. We're here to help. Check out our FAQs or send us an email through our Contact Page.